Far too much of our lives are spent in front of a screen. A recent statistic suggested that over 20% of people with a mobile device participate in ‘second screening’ on a regular basis. This is the process of using a laptop or another mobile device at the same time as watching TV. Given that the majority of us spend around 8 working hours a day looking at a computer screen, it is somewhat terrifying that we go home only to look at another two! It is time to find ways to occupy your family without a screen before the time arrives when we have forgotten how to. People have an intrinsic need to collaborate and cooperate, face to face. Regardless of society and work, children are born with an innate need to socialise and bond with other humans. Cooperation is an essential element of forming relationships and developing emphathy. Family games can utilise school supplies to integrate learning into the time spent away from the TV and computers. Sharing is essential for development, but that does not mean that it is an easy skill. Sharing toys is the first step, and the mantra of ‘please cooperate’ is one which all parents know only too well. The following list of educational games is classroom-tested and provides good opportunities for developing the skills of sharing away from computer screens with basic teaching supplies. Science in school has had all of the fun taken out of it. There is a distinct lack of experiments in today’s classrooms because of large class sizes and health and safety concerns. At home it is far easier to make science exciting without the risk of injury and it provides the perfect opportunity for an educational and fun activity for the family. Household goods can be tested for a wide variety of properties. The exploration of what floats or sinks and what is translucent or opaque can provide children with a deeper insight into the world around them and help them to develop their communicative skills. Get them to engage in the transfer of ideas to enhance learning. Stimulating senses, such as smell, can help to reinforce the understanding of what we eat, cook and experience. Try getting children to identify the smells and ingredients of the foods they eat. It is remarkable how many children fail to comprehend that vegetables grow in the ground and that meat comes from animals. In order to live a balanced and sustainable life, this is a distinction which needs to be made. Planting and tending a small garden with your family will help to enforce the understanding of our lives. In addition to the obvious health benefits, outdoor games promote the development of teamwork and motor skills within young people. Games such as football and rugby will help to develop leadership, teamwork and many more skills. Household jobs such as repainting a room or building a new piece of furniture can be used as great ways to teach collaboration and practical skills. Decorating a bedroom can be a fun experience if it is carried out together and in the right spirit. Approaching it as a fun exercise will ensure it is enjoyable. Your post is the best. there is much much more to life than looking at a screen. smile. nice post,..keep posting and happy blogging.. 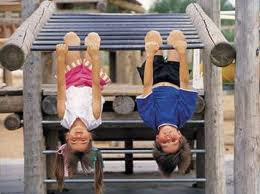 I remember we play a lot in the play ground or school ground. That is why we are very skinny before we don't seat in front of the computer or tv before we don't have them both, lol! !